When I had more hair. This is the blog site for Ted Summerfield, creator of Punzhu Puzzles and ebook author. During the past 30 years I’ve written news stories, sports stories, stories for children, puzzles, and plays for puppets. I have a degree in Broadcast Journalism and am a former member of the Radio Television News Directors Association. The ebooks I’ve written are available at Smashwords and other online ebook stores like Apple, Sony, Diesel, and Barnes & Noble. PDF versions of my mostly 99 cent ebooks are available direct from me through Gumroad here. 60 fun-filled pages of puzzles combining two previously published puzzle books into one inexpensive ebook. 7 different types of symbols including electronic, geometric, architectural, and mathematical symbols. These 174 symbol sudoku puzzles offer your brain a better workout than regular sudoku. Printout the puzzles you want to solve, check your solution in your ebook. Each book contains easy, medium, and hard levels of play. This puzzle ebook may be converted to PDF if required. See my blog for details. “Solving these puzzles was challenging and fun”, “Enjoyed solving your puzzles”, “I couldn’t put them down”. View a free sample or purchase for $1.99 here or at any major online ebook store. Quote Falls Puzzles. Volume 1. You’ll have hours of fun solving these funny, witty, inspirational, and thought-provoking quotes. Quotes from Richard Nixon, Garrison Keillor, E.E. 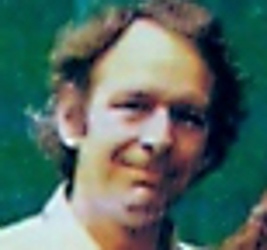 Cummings, H.L. Mencken, Natalie Wood, Hedy Lamarr, William Saffire, Mark Twain, Truman Capote and others. 50 large print puzzles set 2 to a page that you can print out and solve, or solve on devices where typing over images is allowed. View a free sample or purchase for $0.99 at Smashwords, or visit any major online ebook retailer. Quote Falls Puzzles. Volume 2. Volume 2. 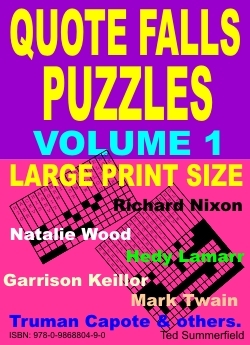 50 large size printable Quote Falls puzzles designed for hours of fun. This ebook contains funny, inspirational, witty, and thought-provoking quotes. Quotes from Benjamin Franklin, Samuel A. Peters, Washington Irving, George Peck, James Thurber and others. 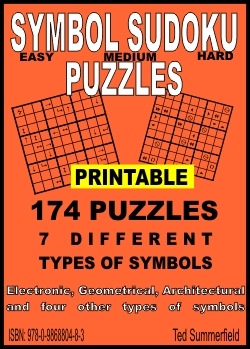 Two puzzles per page that are perfect for printing out and solving, or solving on your device where permitted. 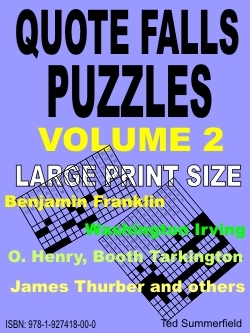 View a free sample of Quote Falls Puzzles, Volume 2, at Smashwords. Or visit any major online retailer. 100 Star Sudoku Puzzles in easy, medium, hard, and very hard levels of play. Whether you are a novice at solving sudoku or an expert solver, you’ll have hours of fun with these Star Sudoku Puzzles. There are 2 large size printable puzzles per page, which you can print out and play or give away. Or, you can solve these Star Sudoku Puzzles on any device which allows typing over graphic images. To view a free sample of Star Sudoku Puzzles, or purchase for $1.99, visit Smashwords. Also available at most major online retailers. Honeycomb Sudoku Puzzles. Free ebook. 36 Honeycomb Sudoku Puzzles absolutely free! Easy and hard levels of play, with solutions included. Print out and solve, or solve on any device which allows drawing/typing over images. Free, free, free. 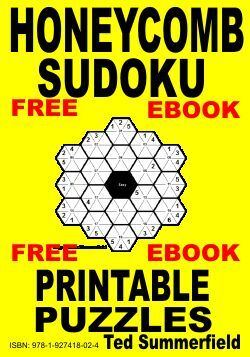 Download your free copy of Honeycomb Sudoku Puzzles at Smashwords. German Word Search Puzzles ebook. Here’s a way to step out of your comfort zone while giving your brain some exercise. More challenging than regular English language word search puzzles, these German language puzzles really tease your brain. Choose from 50 games in easy, medium, and hard levels of play. Puzzles are laid out 1 to a page, with large print for easy reading and solving. 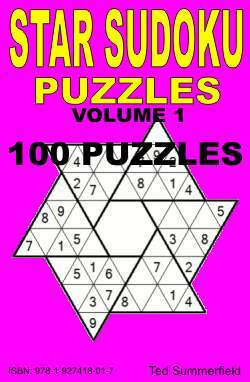 These puzzles were previously published, and are now available to you as an inexpensive ebook. All puzzles are graphic images and can be printed out or solved on any device that allows drawing on images. You’ll have hours of fun solving these puzzles, whether or not you speak German. Happy puzzling, Ted. View a sample of these German Language Word Search Puzzles, or purchase for $0.99, at Smashwords. Also available at most major online ebook retailers. If I Had A Tattoo. 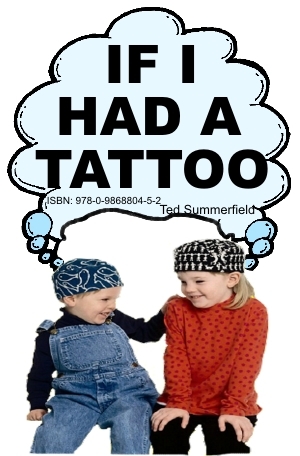 A rhyming picture book story of young boy who thinks he’d like to have a tattoo. He thinks of all the monsters that help him make his bed, do his homework, play sports, and do other things so well and decides those are the kinds of tattoo’s for him. But what if he gets laughed at for having monster tattoo’s? 14 colorful pictures and 6 printable full page black and white drawings of dinosaurs for your child to color and draw tattoo’s upon. Suitable for ages 2 to 102. You may download a free sample, or purchase for $0.99, here. Available at other major online retailers. Icky Foods Make Me Sick. “Icky Foods Make Me Sick” is a colorful, picture coloring book is about a very young girl named Susie Snorz, who is very fussy about what she eats. Susie, who can’t stand to see her baby brother enjoy anything, gets really mad one day because her baby brother is enjoying something she thought would be icky. She learns new things can be good. Appendix contains large black and white pictures for coloring. Suits 2-5 year old. 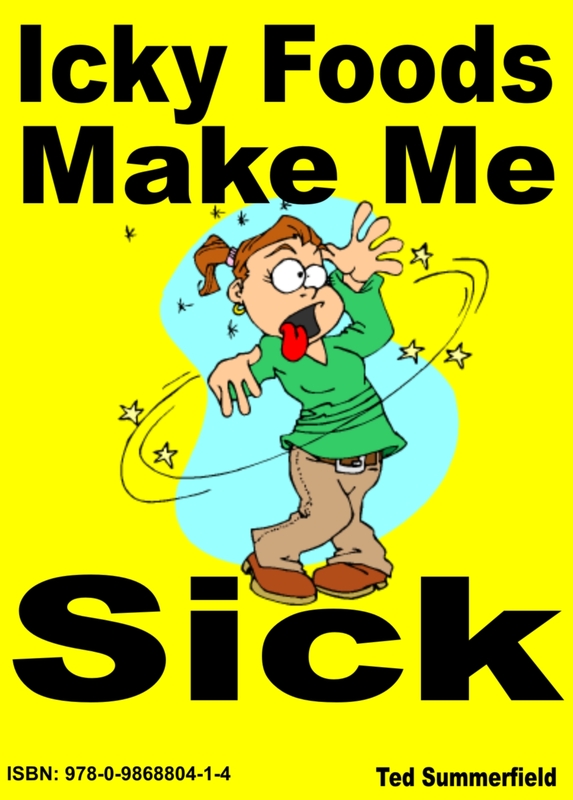 You may download a free sample of “Icky Foods Make Me Sick”, or purchase it for $0.99, from Smashwords here. A Christmas Tree For Santa. A Christmas Tree For Santa is another of my color picture ebooks for children. This story is about Forest Ranger ‘Ranger Rick’, who decides to take a Christmas tree to Santa because there are no trees at the North Pole. On the way, Ranger Rick runs into a thieving moose, a friendly polar bear, a vacationing penguin, Santa’s helpers, and Santa. This colorful picture book for children 2-7 also has large, black and white pictures in the Appendix for printing & coloring. You may download a free sample of “A Christmas Tree For Santa”, or purchase it for $0.99, from Smashwords here. “Bubble Trouble” is a children’s picture book. You can view a sample here. “Doug’s Big Idea” is another picture book for children. You can view a sample here. Thelma And Ziggy is also a coloring picture book for children. You may view a free sample here. Final Decree. A Dead Dog Divorce. “Final Decree. A Dead Dog Divorce.”, a fiction novel about a divorce. Based in part on my divorce. You can read a sample here. 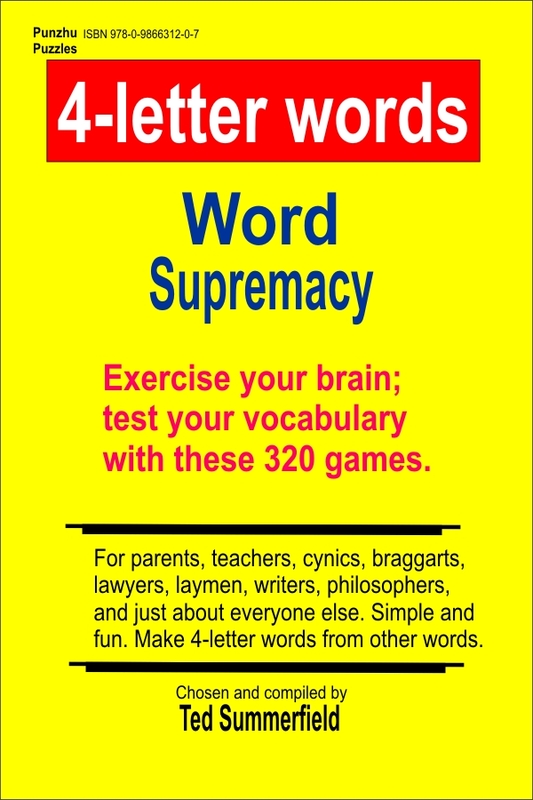 “4-letter Words”; a word puzzle book with 320 word games. You may view a sample here. 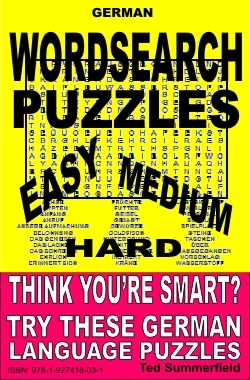 5-letter words is a word puzzle ebook similar to my 4-letter word puzzles ebook, except you try to make as many 5-letter words as you can from a word I’ve given you. Great for learning new words and increasing your vocabulary knowledge. Link to online dictionary included in both 4-letter words and 5-letter words ebooks. 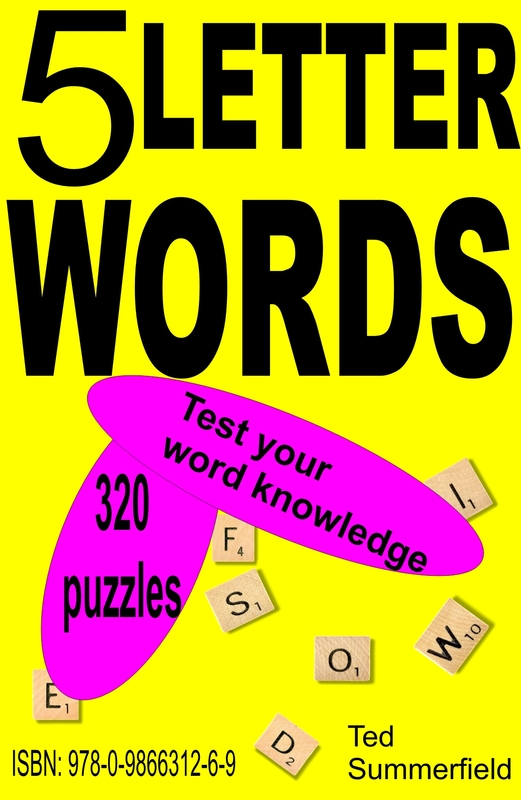 View a free sample of my 5-letter word puzzles ebook here. “Dopey Stories” is a collection of 7 short stories to enjoy over a drink or smoking a joint: Bob the Road Painter, Minnie Tushi meets her love in Bald Knob, Bob and the Dickheads, An Ordinary Man, The Dumb Clucks Who Caused All The Trouble, Sal Acious meets Tim Orous, and The Beautiful Ms. Ann Thrope. 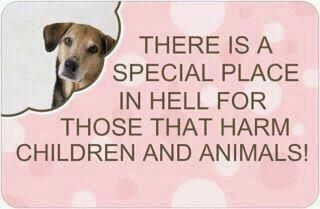 The stories may make you say “huh?” as they are a little weird, but consider the source. 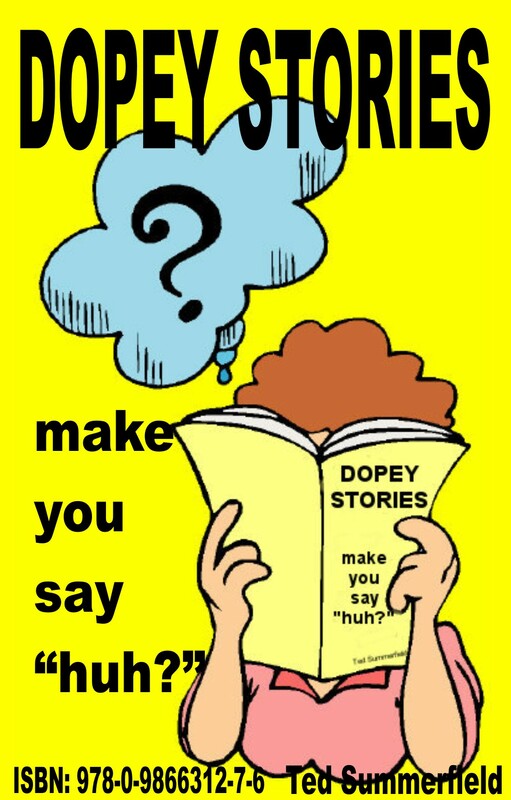 View a free sample of my “Dopey Stories” ebook here, or purchase my ebook here. 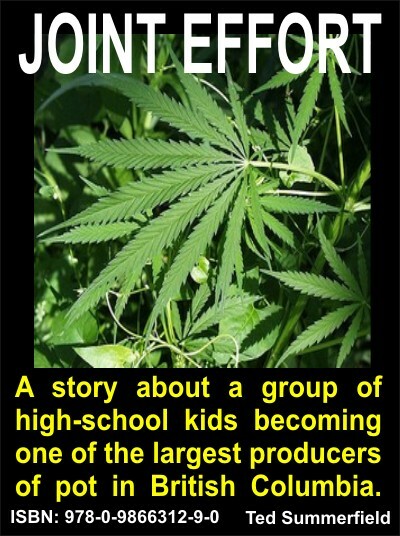 “Joint Effort” is about a group of high school kids who become one of the largest producers of pot in British Columbia. How the group started, how they cleaned their cash, how they moved their product, and how they later built their underground bunkers for pot production, is retold from the account of one of the members. This ebook contains swear words. View a free sample of my “Joint Effort” ebook or purchase my ebook here.